Nail Tek II 15 ml. – Nail Hardener. It helps heal weak, thin soft or peeling nails. This unique protein formulation seals the layers of the nail together. With each application, Intensive Therapy reinforces and thickens nails while promoting strength and flexibility. Use daily under and over the nail polish. 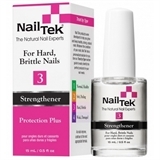 NAIL TEK III 15 ml. – Nail Hardener. Provides extra conditioning for nails that are hard, dry and brittle. This special formulation replenishes the natural moisture content of the nail. Daily application helps to regain the healthy balance necessary to resist stress and prevent breaking. This formulation is ideal for pedicures. Designed for the nail in which the layers of nail tissue separate, lift and peel. Repairs the bonds between the natural vertical fibers of the nail. Rough, ragged nails become smooth, even after the removal of acrylic enhancements. With natural Garlic Extract for adhesion and Silk Amino Acids for flexibility and resilience. Cares for the nails, provides elasticity, helps protect skin and nails against fungal infection. 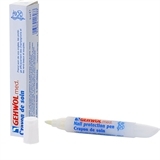 Gehwol Fusskraft Nail and Skin Protection Spray helps improve elasticity and stability and the ability of the nail to bind with water. Panthenol and Vitamin E Acetate promote regeneration. Bisabolol and Clotrimazol help protect the skin and nails against fungal infection. The dosing valve distributes exactly the right quantity of oil onto the nail and between the toes. Designed to improve fragile fingernails and toenails. Regular use strengthens brittle nails and promotes healthy growth. Contains a unique combination of wheat germ oil, vitamin E and chamomile essential oil. Deep penetrating solution quickly absorbs. Care for nails, effective protection against fungal infections - Makes nails beautiful and supple Active Ingredients: Jojoba oil, vitamin E, Panthenol, Bisabolol and clotrimazole Brittle, dry nails become supple, beautiful, and gain a natural silky sheen. Quickly absorbed jojoba oil as well as bisabolol and panthenol care for the skin and nails. The product is designed for the long term use on the nails and its shape makes it particularly easy to apply the active substances. A thin layer of product is sufficient, so the pen may be used over 1000 times. 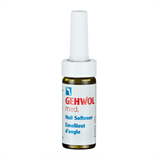 GEHWOL Med Nail Softener makes hard nails more flexible again and helps prevent them growing inwards. It also softens hard skin beneath the nail and in the nail fold, so that it can be easily removed without pain. Bisabolol helps prevent redness and irritation.